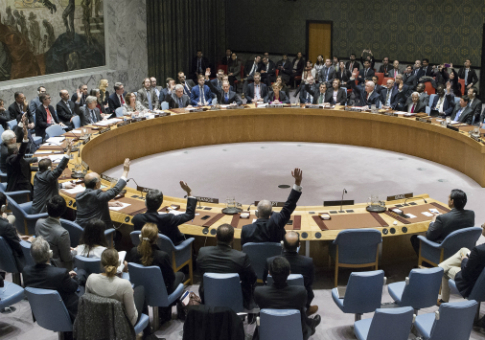 The Free Beacon was the first to disclose on Monday that senior Obama administration officials played a key role in ensuring the measure was passed unanimously by the U.N. Security Council. This included a phone call by Vice President Joe Biden to Ukraine's president to ensure that country voted in favor of the measure. While Biden's office continues to dispute the claim, reporters in Israel and Europe confirmed in the intervening days that the call between Biden and Ukrainian President Petro Poroshenko did in fact take place. "The disgraceful anti-Israel resolution passed by the UNSC was apparently only the opening salvo in the Obama administration's final assault on Israel," Sen. Ted Cruz (R., Texas) told the Free Beacon. "President Obama, Secretary Kerry, Ambassador Power, and their colleagues should remember that the United States Congress reconvenes on January 3rd, and under the Constitution we control the taxpayer funds they would use for their anti-Israel initiatives." "The 115th Congress must stop the current administration's vicious attack on our great ally Israel, and address the major priorities of the incoming administration," Cruz said, expressing his desire to work with the incoming Trump administration to reset the U.S. relationship with Israel.< Senior congressional sources currently working on the issue further disclosed to the Free Beacon that lawmakers on both sides of the aisle are in an uproar over the Obama administration, which they accuse of plotting behind closed doors to smear Israel. "Not content with spending the last eight years using the United Nations to undermine American sovereignty, the Obama administration has finally trained their sights on Israel and is trying to exploit this unelected and unaccountable international body to impose their resolution of the Palestinian issue on Israel," one senior congressional aide told the Free Beacon. "Enough is enough." While the Trump administration will not take office until the end of January, Congress will be working overtime before then to stop the Obama administration from further damaging the U.S.-Israel relationship, according to the source, who hinted that a full cut-off of U.S. funding to the U.N. currently is on the table. "A new administration will arrive on January 20th, but in the intervening weeks Congress has an important role mitigating the damage President Obama can do in his final hours," the source said. "Why on earth would we throw good taxpayer dollars after bad in support of the UN, which has proven itself again and again utterly unable to encourage any positive progress? Just take Syria — if they were doing anything over the last five years, it should have been working out a fair and equitable adjudication of the Syrian war." "Instead, they've proven themselves utterly useless–in fact they've probably made a gut-wrenching catastrophe worse," the source explained. "There's no reason to think this action will turn out any more favorably." A second senior congressional aide working on a package of repercussions expressed fear that the U.N. vote was just the first salvo targeting Israel. "The question now is whether this was the finale or the prologue of what this administration has planned against Israel," the source said, adding that "everything is on the table right now — including funding cuts and scaling back diplomatic relations with countries that brought forward this resolution." A similar list of punitive actions was confirmed by multiple congressional sources who spoke to the Free Beacon about the matter. The sources were granted anonymity so they could speak freely. "Obama went to the U.N. because a U.N. resolution is functionally irreversible by normal means," added a veteran foreign policy insider who is currently working with the incoming Trump administration. "Obama's goal was to eliminate any limited options that could be used to repair the damage to Israel, and he gambled that Trump and Congress would be too intimidated to use the remaining big stick options. He's going to lose that gamble." "American leaders will now use exactly those options," the source explained. "Everything is on the table, from systematically going after the U.N., to moving the U.S. embassy into parts of Jerusalem the U.N. says aren't Israeli, to kicking the Palestinians out of Washington." "Members on both sides of the aisle are furious, so our response will be swift and forceful," the second congressional source said. "With a Trump administration in place, any nation that seeks to delegitimize the Jewish state will need to answer to the United States." This entry was posted in National Security and tagged Congress, Israel, Ted Cruz, United Nations. Bookmark the permalink.